2 Boxing Day Pilgrimage to to Fountains Abbey - Fungi, Flowers, Birds and Cellarium Song. Yorks. 4 Eco Church scheme in SW defies government cuts 13 Dec 2011. Elizabeth Rendall died on 19th November 2011. She was a very supportive member of CEL and represented CEL on the National Justice and Peace Network (NJPN) for many years where she was a leading advocate on environmental issues. Her funeral is at 11am on 1st December at our Lady of Lourdes Catholic Church, Wanstead. 4 Celebrate:- 31 Oct-2 Nov - Green Pilgrimage Network launch in Assisi - Duke of Edinburgh - WWF 50 Yrs old. MORE NEWS & ARCHIVES .. 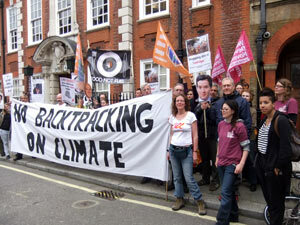 Climate Service and Rally on 3 December in London 2011.Prayers at St Mary-Le-Bow at (11 for) 11.30am. Rally to Parliament in afternoon. Vigil at 11.30pm (Fri 2 Dec)-1am Sat. on shore of Thames near Millennium Bridge. 1 Celebrate:- 31 Oct-2 Nov - Green Pilgrimage Network launch in Assisi - Duke of Edinburgh - WWF 50 Yrs old. 2 The Anglican Communion Environmental Network has just met in Peru 4-10 Aug.
5 Could you live off just £1 a day for five days? Join the livebelowtheline challenge during Become aware of how much we consume unnecessarily - and how difficult it is for poor people. "You learn a lot!" And get sponsored for a charity of your choice (within a range) that helps poor people. At this time of year we remember Jesus who suffered and gave his life in love for God and for the people of his time and for us - a "future generation" to him. Political leaders in areas of conflict, and innocent individuals trapped in between. In CEL's April press release ... CEL Steering Committee spells out facts and action re energy issues. 4 JRI January Newsletter is worth reading. Good reports of recent events. 7 Poster for CEL London Conference - Peter Owen Jones + Tim Cooper on 5 March. Christian Ecology Link Ltd: Green Christian is a registered trading name of Christian Ecology Link: info@ greenchristian.org.uk. +44 (0)845 4598460 Correspondence Address: 97 Plumpton Avenue, Hornchurch RM12 6BB, UK. - Company Reg. No. 2445198 - Reg Charity No. 328744.